ZillowThe lavish pool area with its fountain was featured in the wedding scene in the 1983 movie. 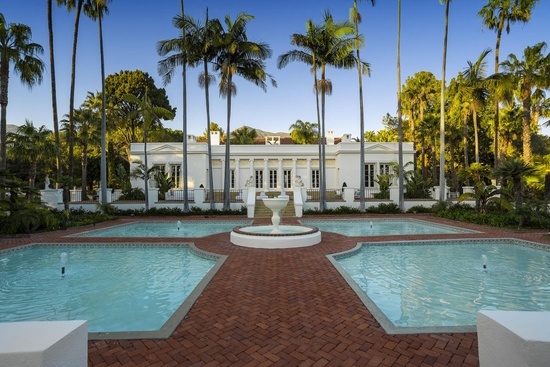 After 17 months on and off the market, the Mediterranean-style mansion where "Scarface" left its bloody mark on cinematic history has sold for a whopping $22.7 million less than its original asking price. The buyer said, "Say hello to my $12.3 million!" And the seller said, "Alrighty then." The 1983 movie starring Al Pacino was filmed partially at the 1906 mansion in Santa Barbara, which originally was listed for $35 million. The most recent asking price was $17.9 million. The Mediterranean estate surrounded by fountains and Persian gardens is memorable as the site of the Pacino character's most famous line, shouted over the blast of his machine gun: "Say hello to my little friend!" The Roman-style mansion at 631 Para Grande Lane was designed by architect Bertram Goodhue. Its name, "El Fureidis," means "Tropical Paradise," according to the listing. The four-bedroom, nine-bath home sits on 10 acres. Its rooms are artistically detailed with painted and gold-leaf ceilings, tiled rooms, woodwork and carvings, and a unique pool with fountains. The listing was held by Village Properties/ Christie's International Real Estate.